After watching a Peyton for years dominate games in Indianapolis, the Colts and their fans watched an opposing Peyton beat them on Sunday. Browns bruising back Peyton Hillis slammed the Colts for 94 yards on 27 carries and a pair of scores as the Browns beat the Colts 27-19 to send them to 0-2. Indianapolis had their chances, as they were up 9-7 with 3:53 left in the first half, but then the Browns got a late TD from Hillis before the half, and outscored Indy 13-10 in the second half to improve to 1-1. Kerry Collins again was mostly ineffective against a Browns D that bent but held their own when it counted. Collins was 19-for-38 for 191 yards with a touchdown and a pick. He also had a key fumble that eventually allowed the Browns to score to seal the game. Cleveland outgained the Colts 304 to 285, and Colt McCoy was careful with the ball, going 22-for-32 for 211 yards with a touchdown to Evan Moore that made it 7-6 Browns in the second quarter. The Browns ground game in the second half did a nice job keeping the ball out of the Colts hands, as they held the ball for 34:34 to just 25:26 for the Colts. Cleveland outgained the Colts 303 to 285. 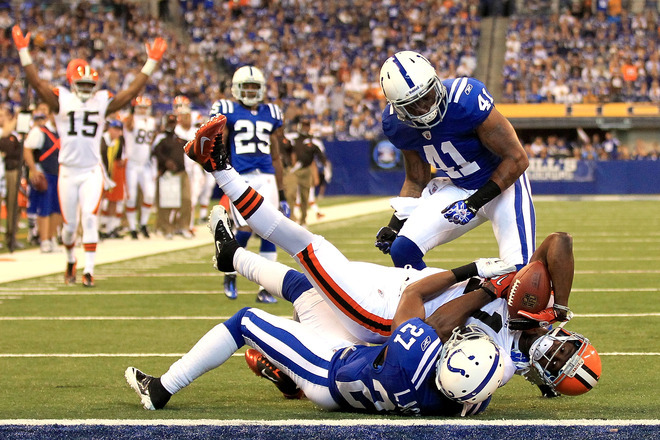 The game was won by Cleveland due to the fact that the Colts couldn’t convert short fields into touchdowns. They had to settle for field goals of 39, 27 and 36 yards. Adam Vinatieri did nail a 52-yard field goal as well, but instead of field goals, touchdowns would have been a welcome sight. The home crowd booed the home team as Cleveland took a late 24-12 lead after a Colts punt that gave Cleveland the ball at the Colts 28 after a Josh Cribbs 43-yard return. Hillis went in from 24 yards out to make it a 12-point game. A Collins fumble that the Browns recovered with 3:18 to go sealed it as Phil Dawson kicked a short field goal to make it a 27-12 game. 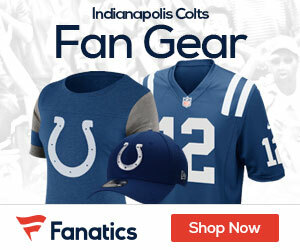 The Colts next week will stay at home as they host the 1-1 Steelers, who beat the Seahawks 24-0 in Pittsburgh on Sunday.